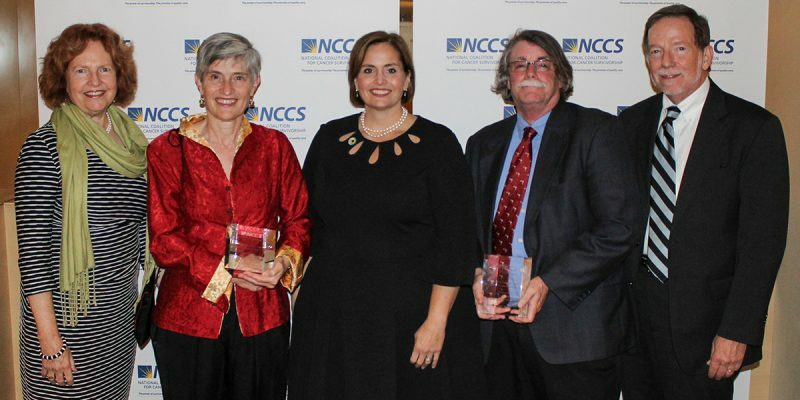 Left to right: Dr. Julia Rowland, Honoree Martha “Meg” Gaines, NCCS CEO Shelley Fuld Nasso, Honoree Patrick Coyne, and Dr. Thomas Smith at the 2017 Stovall Award Reception on October 19, 2017. Silver Spring, MD – The National Coalition for Cancer Survivorship (NCCS) presented its second annual Ellen L. Stovall Award for Innovation in Patient-Centered Cancer Care last night in Washington, D.C. After a nationwide competition, a distinguished selection committee chose this year’s winners, Pat Coyne, MSN, of the Medical University of South Carolina and Meg Gaines, JD, of the University of Wisconsin at Madison. Mr. Coyne was nominated by Thomas J. Smith, MD, of Johns Hopkins University School of Medicine. Ms. Gaines was nominated by Julia H. Rowland, PhD, recently retired director of the Office of Cancer Survivorship at the National Cancer Institute. 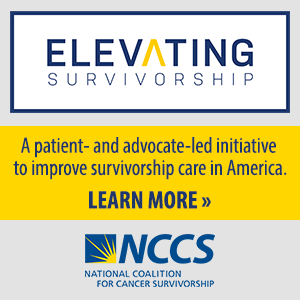 Named for longtime CEO of NCCS and three-time cancer survivor Ellen L. Stovall, who died in 2016, the award aims to honor her memory and advocacy by annually recognizing individuals, organizations, or other entities that are innovators in improving cancer care. Applications for the 2018 Stovall Award will be accepted beginning February 1, 2018. Mr. Coyne, an advanced practice nurse, has devoted his career to the advancement of the field of palliative care. He is one of the founders of ELNEC (End-of-Life Nursing Education Consortium), which has educated more than 21,000 nurses in over 90 countries, and he has published over 100 papers on a variety of symptom management and policy issues. Ms. Gaines is a lawyer by training, a cancer survivor, and one of the founders of the Center for Patient Partnerships at the University of Wisconsin. The Center trains students in the fields of law, medicine, nursing, pharmacy, and social work to provide advocacy to cancer patients. Interdisciplinary teams help cancer patients understand their diagnoses, get the information necessary to make critical treatment decisions, and support patients’ efforts to get the treatment they need.